I’m always surprised by a holy moment. It can happen anywhere, but my kitchen sink sees more than its fair share of holy moments. My own burning bush, my own miraculous catch of fish, my own walk on the water has often happened as I stood at that sink. Any ground is holy ground when you know in your heart God is speaking to you there and then. It happened again the other morning. I have a cracked bowl from Crate & Barrel. The last of a pair, I cherish it. It’s absolutely perfect for cereal, oatmeal, yogurt & berries, ice cream, cobbler, rice, and, well the list goes on and on. I love how it feels in my hand. The weight of it and the smooth surface that welcomes my palm and nestles in to sit comfortably and serve happily. I’m very careful with it. I’ve looked and can’t find more so it’s precious, it’s rare. I hand wash that bowl. I’m not taking a chance on the heat of the dishwasher making the crack worse. I’d be bummed if another bigger, ‘bully’ bowl leaned on it in the crowded rack. And then there’s the risk someone else, unloading the dishwasher, might drop it. No. I hand wash it and put it away carefully. The other day I had washed it and was getting a clean dishtowel to dry it when I felt God tell me I was like that bowl to Him. I was flawed yet favored. Cracked yet cherished. We are suppose to live examined lives, but we aren’t to put our focus on our flaws. Confess our sins, know our areas of needed growth, but keep our hearts full of the knowledge of God’s unlimited love for us, His complete acceptance of us, and His constant desire for our fellowship. Remind yourself of those things today, throughout the day! I don’t know how to repair my bowl, but God knows how to repair our flaws. He says we are His own workmanship, and that means He knows how to fix what’s damaged and correct what’s flawed. Leave yourself totally in His hands. You’ll be safe there, cherished and protected. He knows how handle us and make us useful in spite of our flaws. You’re gonna love how you feel in His hands. I SO LOVE THIS!!! Simple, beautiful, profound!! And you touched me so much, I just checked google/ebay – any good? I never thought to try eBay!!! Duh 😉 Thanks Paul. What a nice analogy to think about. 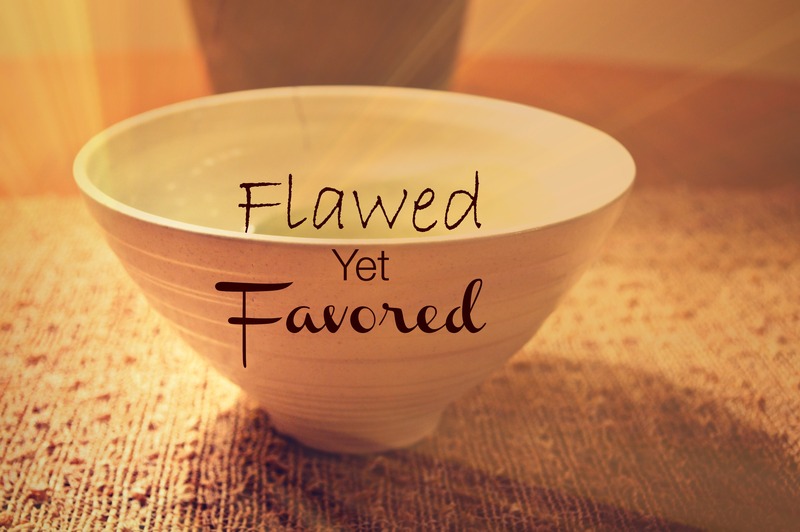 Amen – so true and amazing that God chooses flawed ones and cherishes them! Thanks for posting! I was thinking about Hebrews 11 and how some of the people God mentions really blew it at times, but God remembers their faith despite their failures! Because He never changes, we can believe the same is true for us. I’ve been meditating on Phil. 4:8 and remembering God’s exhortation to think on what is worthy of praise. God does that with us, He’s looking for our best moments.